The Simpsons has established itself as an award-winning international pop culture phenomenon. It is the longest-running sitcom of all time and it is also one of the most literate television programs on the air, containing many references to subject matter and scholars from various academic fields, including mathematics. Since The Simpsons has been airing in prime-time for most of our students' lives, they likely are familiar with the program and its large cast of characters, including a resident scientist. 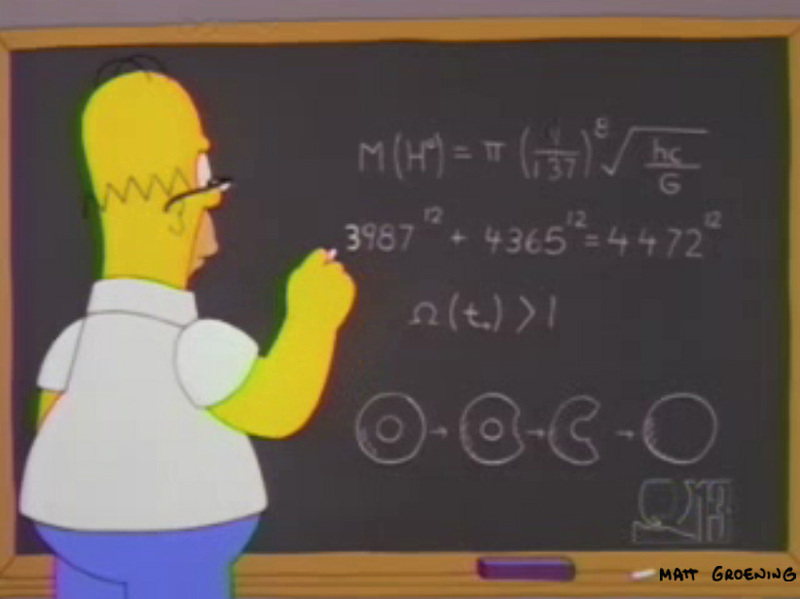 The Simpsons also contains over a hundred instances of mathematics ranging from arithmetic to geometry to calculus, many designed to expose and poke fun at innumeracy. 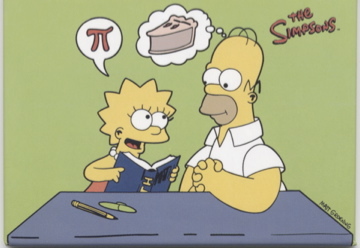 In fact, Al Jean, Executive Producer and head writer, has a bachelor's degree in mathematics from Harvard University. Several episodes of The Simpsons contain significant mathematics that relates to material we normally cover in our classes. For these reasons, this program is an ideal source of fun ways to introduce important concepts to students, and to reduce math anxiety and motivate students in courses for non-majors. 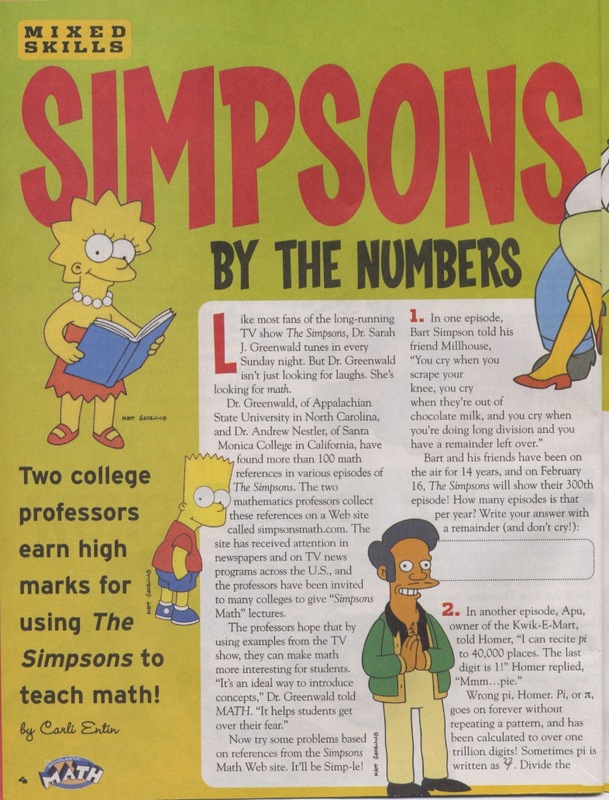 Text transcript of our 15-minute presentation "r dr r: Engaging Students with Significant Mathematical Content from The Simpsons" and the related PRIMUS article, Vol XIV, Num 1, March 2004, pp. 29-39. See also impact on students and Popular Culture in Teaching, Scholarship, and Outreach: The Simpsons and Futurama, 2017. 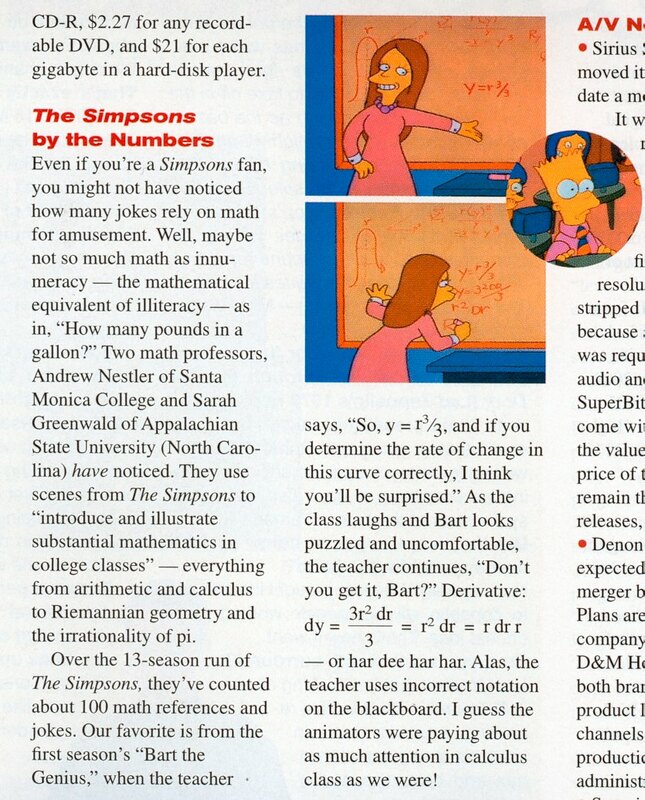 Summary of Math-Club whose audience included a number of Simpsons and Futurama writers, April 6, 2005. The Simpsons Season 7 DVD Audio Commentary, Treehouse of Horror VI [3F04] Homer3, DVD Release December 13, 2005. The Simpson Scholars: ASU's Satellite Q&A Forum, by Leigh Ann Henion, The Mountain Times, February 20, 2003, p. 13. 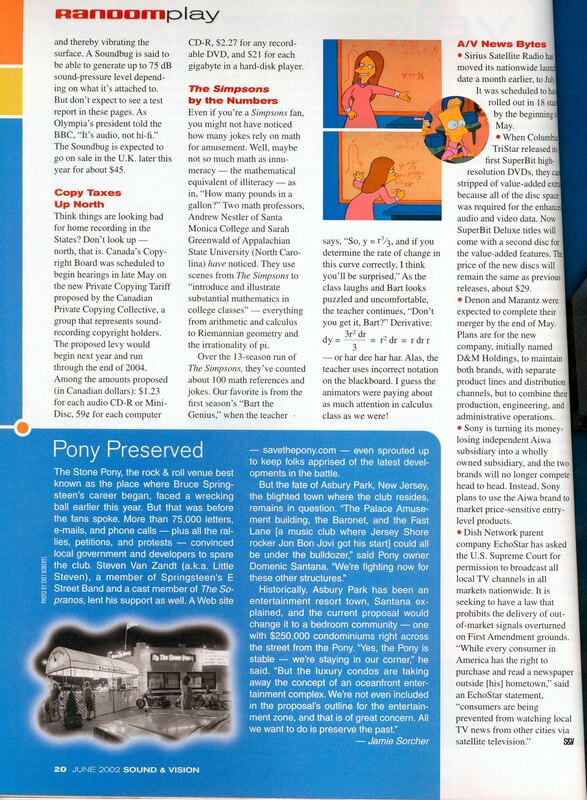 Math on The Simpsons, by Carli Entin, Scholastic Math, February 14, 2003, Vol. 23, No. 9, cover story and pages 4-5. 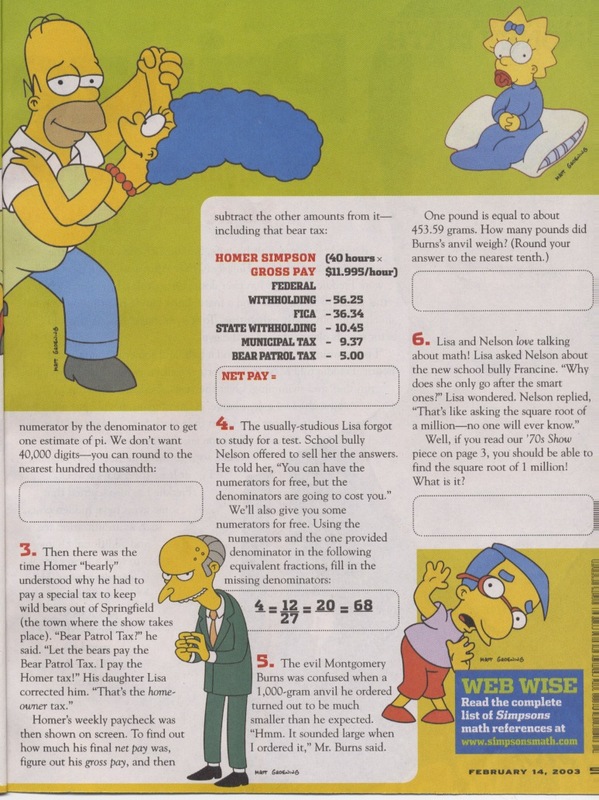 The Simpsons by the Numbers, by Brian C. Fenton, Sound & Vision Magazine, June 2002, p. 20. 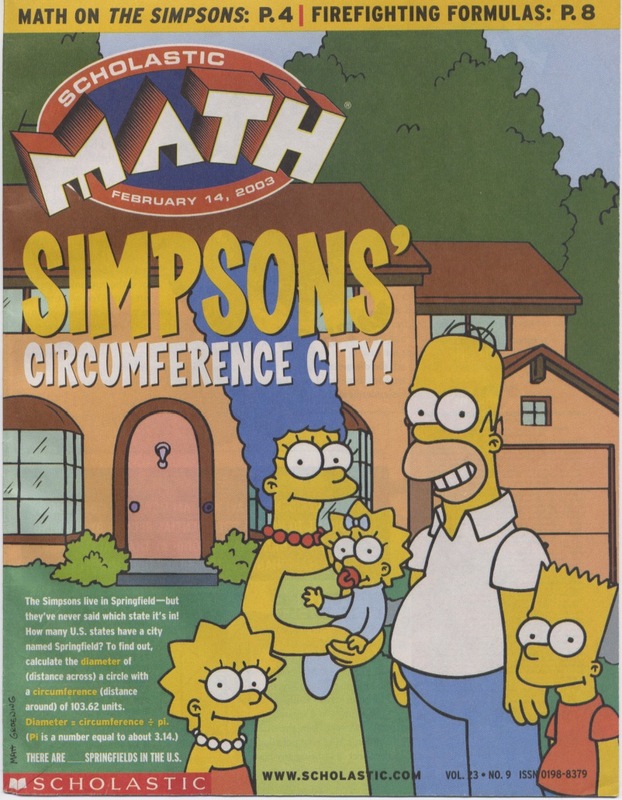 'Simpsons' Analysts Show How Math Figures into Episodes: Professors Use Popular Cartoon to Demonstrate that Subject Doesn't Have to be Intimidating, by Matthew Chin, Los Angeles Times Inland Valley Edition, March 19, 2002, p. 2. In many regions of the US, repeats of The Simpsons air daily, while new episodes air on Sunday nights. Information on the DVD box sets of The Simpsons can be found at the official site Fox Shop. Legal Notice: The Simpsons TM and copyright Twentieth Century Fox and its related companies. This web site is for educational use only. To view these pages, you must agree to these terms. We do not benefit financially in any way from this web site. The images on these pages were taken from episodes of The Simpsons that are copyrighted by Twentieth Century Fox. We will not distribute audio, video or image files.